This traditional Chestnut Stuffing recipe comes from the "Good Housekeeping Cookery Book" published in England in 1978. What is proves is that some of the best recipes are old ones. This recipe calls for the use of chestnut puree. You can buy chestnut puree online through Amazon. Some specialty grocery stores may carry it. If not, you can make homemade chestnut puree. We've supplied a recipe below. Fry bacon gently for 3 to 5 minutes until crisp. Drain the bacon and add the rest of the ingredients, binding with the beaten egg. This stuffing is suitable for a 10 lb. turkey. Increase measurements as needed. 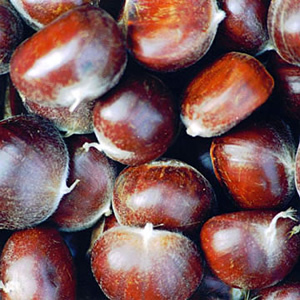 Using fresh chestnuts - snip the brown outer skins with a pair of scissors or sharp knife. Place the chestnuts in a pan of boiling water for 3 to 5 minutes. Lift out a few at a time and peel off both the brown and inner skins. Gently simmer the peeled chestnuts in a little chicken stock until tender, about 35 to 40 minutes. Puree. 1 lb. of fresh chestnuts will yield approximately 14 oz. of unsweetened puree.